> Another day, another loss, another useless referee. Owing to some confusion we have ended up with two separate reports on the West Brom game. I thought as both Simmo and myself had put a fair amount of work into a game neither of us enjoyed, the least that I could do was to publish both. It is interesting to see our different takes on the game! Enjoy . . . . .
Hal Robson-Kanu scored a stunning winner on his first Premier League start since May 2013 as West Brom came from behind to beat Southampton. We made six changes following a 4-1 loss to Spurs, which I actually managed to get to FFS and were typically toothless and ultimately exposed by an at best workman like WBA. Virg adding two cards to go with his Christmas ones didn't exactly lighten the load, his unavailability to play against Everton for pulling back Salomon Rondón on 88 minutes, was harshly exposed by a Yoshi howler against the Toffees. Anyway back to West Brom, I thought the game was on new years day, and although I had only plans for MOTD style highlights to furnish me with the facts for this report I was caught slightly of guard...and a couple of beers in to my NYE celebrations. It was 1-1 when Sky Sports was popped on the TV as I set about lighting a fire in the front room. It sounds like we were, as is oft the case, the brighter starters yet having had much of the play didn't create many clear-cut openings, Boufal smashed one across the face of goal which Long may feel me could have done better with and McQueen is Dead (right Smiths pun fans) had another chance to open his senior account. So having bossed territory and possession yet rudderless up top it must have been relief all round when Long rose to head home from a Tadic corner, opening their goal and assists accounts respectively for the season. Being one nil up was to prove rather short lived, another lucky bounce and the ball fell kindly for Phillips who stuck it where everyone new he would, Frase however couldn't prevent the inevitable. yet another goal from the oppo's first shot on target. Frase Stekelenburg having a rough time of it at the minute, the lowest shots to goals ratio in the league for the England No.2 a stat he is probably taking over from the previous incumbent of our keeping jersey. Frase made a massive difference to our season last year and we could do with him finding some form. We didn't, Sims came on and livelied things up a touch according to Charlie Nicholas who also said Martina's crosses and his general play was rubbish. A now familiar pattern of us failing to look like we would really ever break down a well drilled defence with a lead to hold on to, our ability to keep clean sheets deserting us. Let us not forget however at the halfway stage of the season we are three places better off than at the same stage in 2015-16 but have scored seven goals fewer...things will improve I'm sure. We'll need to pull of some smart business in the winda, our summer signings still have a way to go to find their feet and one of them has a way to go to the ACN which isn't helping much. The feel good factor post Milan has worn off, the positives of the integrated squad, fringe players feeling part of things, young players breaking into the side has been tempered by a lack of goals and suspected rancour off the pitch. Lets hope Puel can steady the ship, and get the players firing again soon. OMG, was this a case of deja-vu? In the Spurs home game on Wednesday, Saints scored early, conceded to go in 1-1 at half time, conceded again at the start of the second half and then had a player sent off. This time, less than three days later, Shane Long broke his duck to score in the 41st minute. Saints then completely switched off and handed the equaliser to the Baggies just two minutes later. Once again it was 1-1 at half time. Within 5 minutes of the restart Saints conceded again and you could see the heads drop. The sending off came almost at the end of the game when the clearly frustrated and already booked Virgil van Dijk hauled down Rondón. Mike Jones flourished a yellow, followed by the red card. In the last two games Saints have scored twice (both from set pieces), the opposition have stuck 6 past Fraser Forster and we have had two players sent off in Redmond and van Dijk. Not really the best of weeks. The Bournemouth game seems a long time ago now. This Christmas period was always going to be a problem from the moment that the Spurs Boxing Day matched was delayed by two days. That meant hardly any recovery time between the Spurs, West Brom and Everton games. Looking at the team there were some surprises, some predictable. Martina was in for Cédric, Yoshida for Fonte, McQueen for Bertrand. In the middle Højbjerg replaced Ward-Prowse and up front JRod was replaced by Shane Long and Dušan Tadić was in for the suspended Nathan Redmond, after his sending off in the Spurs game. Both sides seemed to be doing their very best to not score and were succeeding admirably, up until the moment a tempting cross was floated into the West Brom penalty area and Shane Long directed a wonderful header into the top right corner. So, that was his dry spell ended and there were only four minutes to half-time, so the team would go into the break in good spirits. Yeah, right. 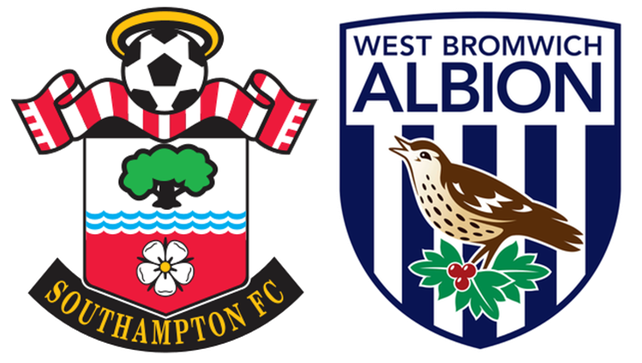 Straight from the kick-off West Brom went for the jugular and within 2 minutes Matt Phillips had finished off a move which ended with Forster kicking the ball in frustration at the back of the net. 1-1. Here we go again. You could see the confidence draining from the players. Kiwi's have a great multi-purpose word for moments like this - Bugger. Just about now came a dreadful example of refereeing when Nyom, who had already been booked, hauled down a player in what looked vaguely like one of those Saturday afternoon wrestling matches on ITV when I was a child. In the face of Nyom's blindingly obvious guilt, he just got a finger wagging telling off from Mike Jones. Which was bloody rich, considering what was to happen later in the game. I must admit a begrudging respect for tony Pulis when he replaced Nyom at the start of the second half, thereby removing the risk of him being dismissed. There was a general air of inevitability about the state of the game amongst the crowd during half-time, after all we had been here before, just three days before. The second half started and things went from bad to worse pretty much straight away, only this time the goal was a simply unstoppable shot from Robson-Kanu. Any remaining stuffing seemed to have been knocked out of the team in red & white stripes. Claude Puel reacted straight away, hauling off Højbjerg and sending on JRod. LEt's just say that the Dane did not take this too well. He went straight down the tunnel, pausing only to aim a hefty kick at some poor unsuspecting drinks bottle. Nothing much changed and Puel then sent on Sims for Tadić and almost immediately after Ward-Prowse for Martina. This had some effect and Sims in particular was now asking questions of the West Brom defence. Saints were throwing everything forward and eventually got caught out. A pass over the top found the West Brom substitute and top scorer, Rondón. He and van Dijk tussled and it was clear that the Baggies player was getting the better of things. So, van Dijk pulled him back. Now, bearing in mind this was the 89th minute and van Dyke had already been booked, it didn't look good and so it proved. The hapless Mike Jones sent van Dijk off, in spite of the fact that he had allowed Nyom to remain at the end of the first half. That was essentially that. Saints didn't deserve to win, but for the second match in succession they paid a high price for some rank bad refereeing.